Please log in to see 2999 products of the shop. WeisteShop is webshop for retail customers of K.A.Weiste Oy. Please, log in to see the wide range of our Christmas and Home Design products. To get access to Weiste webshop, please register by pressing button below and following the instructions. 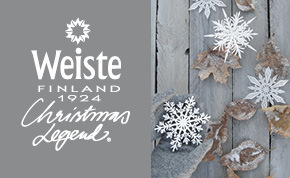 K.A.Weiste Oy is one of the oldest Christmas decoration manufacturers. Our products include Christmas Legend decorations like balls, bells, braids, garlands as well as top stars. You can also order our VillaWeiste nice small home decor goods, white wood, old roses romantic, trendy rust and patina of time, rustic, country style. 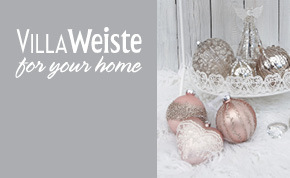 Weiste also imports other Christmas decoration products like angels christmas lights and candle holders. Read more about K.A.Weiste Oy:stä from our website http://www.weiste.fi.